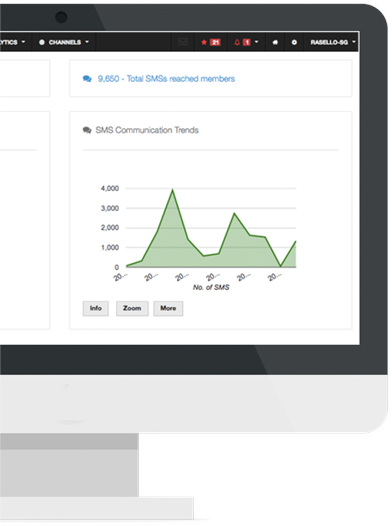 The most unified digital communication software. Rascom is full of features that make every business to customer communication experience better, more practical and surprisingly inspirational. Rascom has over 2 million+ customers managed on the cloud by various businesses across the world. Businesses can manage customer records, track customer activity, initiate digital marketing campaigns, track communication effectiveness, automate relationship building, raise invoices, manage tasks and ultimately communicate to customers via SMS, Email, Voice, Telegram and Social channels. Taking it a step further, Rascom helps you discover the conversations about your brand, product, service and market as it happens. Rascom intelligence engine automatically suggests interesting content that can be re-posted on your social pages helping you seamlessly engage your audience. Rascom works like a CRM Software better tailored towards Enterprises in emerging markets focused on their need to automate business to customer communication.